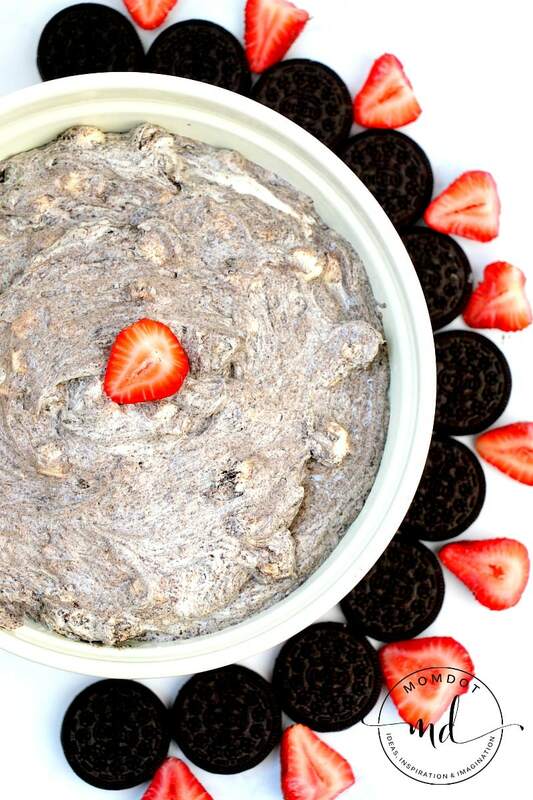 OREO Fluff Recipe with Pudding, a no bake cookie dessert dip that you can make with any flavor pudding. 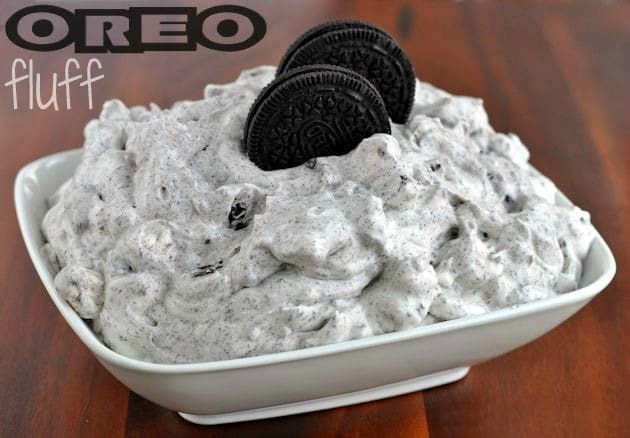 With only 5 ingredients, this OREO fluff recipe only takes 5 minutes or less and will make you completely addicted. Serve with cookies or even as a cupcake topper! Hands down OREO’s are my favorite cookie of ALL time. The issue is I can’t just eat one. 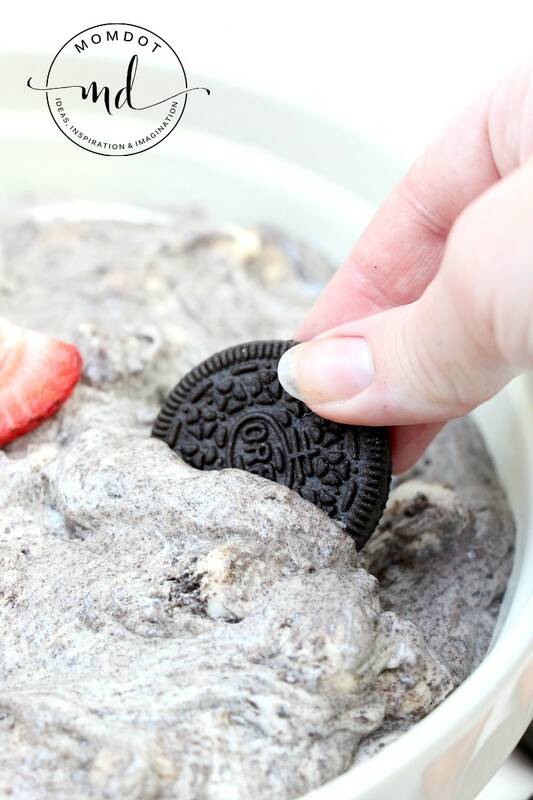 And while I appreciate that the serving size of most OREO’s is 3, I could eat like 10 dunked in milk without a second thought- or this perfectly delicious and decadent dessert dip. 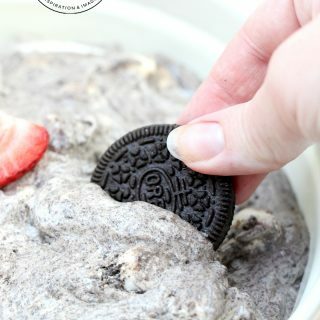 Now whether you are like me and eat them all or love to savor, you will enjoy absolutely love this OREO Fluff recipe! Perfection in white chocolate (or vanilla like we did in our OREO Fluff Video), this is a no bake dessert that is ready so quickly you will always have something ready for a party or when friends drop by unexpected. Plus, kids LOVE to make this one and with no heating required, this dessert is easy for them to make! Now while we used Oreo’s, you can turn your favorite cookie into a white, creamy, fluffy dessert fun for Holiday or birthday parties. I am sure it’s easy to substitute for chips-ahoy, golden OREOs or even vanilla wafers. Watch our Video or scroll below to get the full printable recipe. This creamy and delicious dip will be one of those “WHAT DID YOU PUT IN THAT” scenarios that makes you look like a full on pastry chef- without the work. You can print this recipe below if you scroll down to the bottom. Printing makes it easy to follow in the kitchen so your fingers don’t make your phone sticky. Trust me, I know! In a large bowl whisk together the pudding mix and milk for 2 minutes. Now add Cool Whip, OREOS and marshmallows , and stir well. Refrigerate your Fluff until ready to serve. 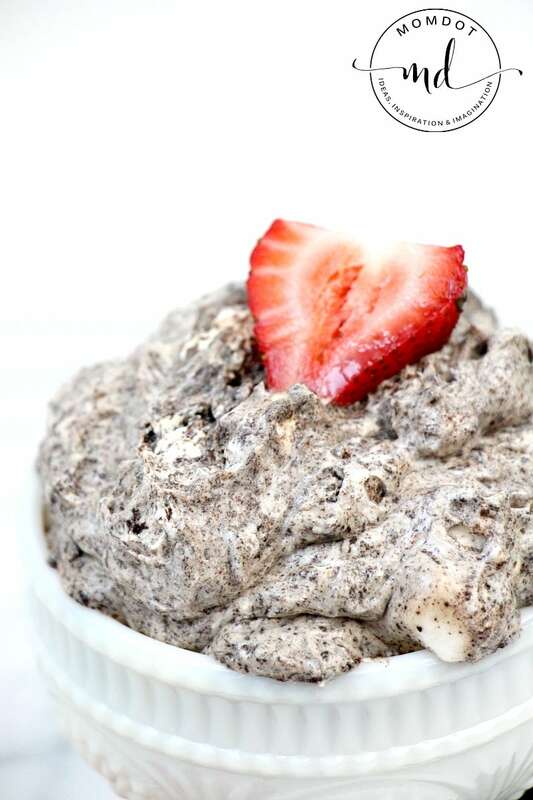 A no bake OREO Fluff dip with white chocolate or vanilla pudding and OREO's. Dip your cookies in cookies! In a large bowl whisk together the pudding mix and milk for 2 minutes. Note that the pudding instructions are different than this recipe. Add Cool Whip, crunched up OREO'S, marshmallows, stir well. Refrigerate your OREO Fluff until ready to serve. Pudding Flavor: I have tried white chocolate and vanilla pudding, either work great.